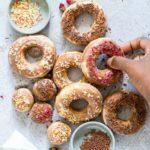 Air Fryer Donuts are a healthier version of your favourite sweet treat that is fun and easy to make! Combine flour, sugar, yeast, nutmeg, and salt in a bowl. Add in the milk, butter, and egg and stir into a soft dough. Place donut dough onto a lightly floured surface and knead for a couple of mins until smooth. Transfer it to a lightly oiled bowl, cover it and let rise in a warm place until doubled in size. Turn dough out onto a lightly floured surface and roll out to 1/4-inch thickness. Cut out 7-8 doughnuts using a 3-inch round cutter. Then use a 1-inch round cutter to remove center. Place the both the donuts and donuts holes on a lightly floured surface, cover loosely with a cloth and let stand in a warm place until doubled in size (approximately 30 mins). Pre-heat air fryer to 350F / 180C and spray the basket with cooking spray. Place half of the donuts in single layer inside the air fryer basket and cook for 4-5 mins until golden. Repeat with remaining doughnuts and holes. Lay the biscuits on a flat surface. Use a small (1-inch) round cookie cutter to remove center. Pre-heat air fryer to 350F / 180C and spray the air fryer basket with cooking spray. Place the donuts in a single layer inside the air fryer basket (do not stack) and lightly spray the donuts with oil. Cook for 4-5 mins until golden. Repeat with remaining donuts and holes. Whisk together powdered sugar and water in a bowl until smooth. Dip the donuts and donut holes in the sugar glaze, then place them on a wire rack set over a rimmed baking sheet to allow excess glaze to drip off. Top donuts with sprinkles and edible flowers. Let donuts stand until glaze hardens (about 10 mins) before serving. Do not stack your donuts in the air fryer. Allow enough room for the air to circulate around your donuts so they cook evenly. For best cooking results, make sure your donuts are the same size. But you can have fun any vary the size of your donuts from batch to batch. Clean out the air fryer basket between batches to make sure there are no pieces of dough remaining and to avoid and burning. There are 10 Freestyle Points in one serving of Air Fryer Donuts.